Your favorite big brands have big plans for Africa. 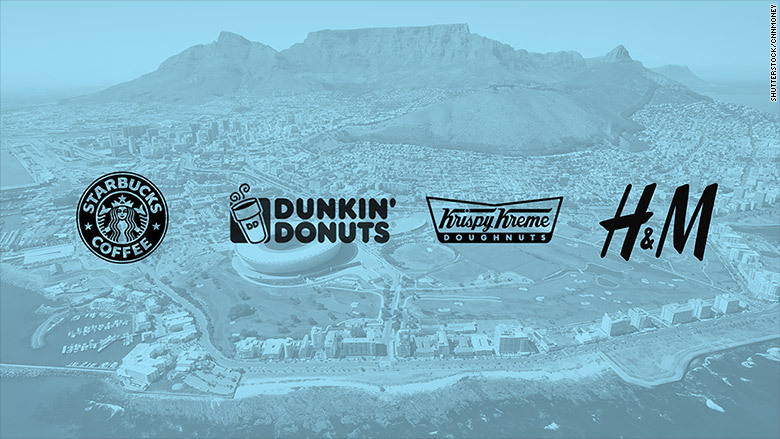 Krispy Kreme (KKD) and H&M (HNNMY) are launching in South Africa this month, marking their first foray into the African market. Starbucks (SBUX) is set to open its first store in South Africa in early 2016. And Dunkin Donuts (DNKN) has also announced plans to set up shop in the country. Big businesses are looking to get into Africa to tap into profits in growing emerging markets. The Sub-Saharan African economy is expected to grow by almost 4% in 2015 and companies see South Africa as a gateway into the region. Swedish retailer H&M was the latest to break into the market earlier this month by opening two stores in South Africa's Cape Town and Johannesburg. Thousands of customers flocked to the stores and some shoppers even slept outside the malls for two consecutive nights to be the first people inside the shops. U.S. doughnut giant Krispy Kreme is opening its newest store in Johannesburg's Rosebank Mall on Wednesday. "We're eying out markets like Kenya, Nigeria and Ghana but we want to test the waters first in South Africa," said Krispy Kreme's international vice president, Michael McGill. "Within five years we could be in five or six countries in Africa... this is the hottest new market in the world." Businesses don't seem deterred by South Africa's sluggish economy, which is currently lagging the rest of the region. The government is forecasting growth of just 1.5% this year. Krispy Kreme's top South African executive Gerry Thomas said he plans to open 31 stores in prime locations in Africa in the next five years. "We like competition and maybe Starbucks will follow us to our locations," he said. But these newer entrants are following long-time players Seattle Coffee Company and Cinnabon. Seattle Coffee has been operating in South Africa since 1996. Cinnabon launched in 2006. But both companies don't have a large footprint in the country.